I saw this building first here on flickr, on dave morris' photostream and later on iqbal aalam's and found it very beautiful. seeing it in oxford, it did not disappoint. that an engineering company could produce modern architecture of this order took me by surprise. clearly philip dowson, who was the architect in charge, was in a very strong position within the company to achieve something as powerful as this. he was awarded the royal gold medal in 1981 - the street front of the wolfson alone justifies it - and the RIBA has a brief text about it on their site: his approach was always a rational, scientific one, it says, which makes a lot of sense given the background of arup, except that the wolfson building is a work of art and works of art don't arrive by accident or by science even if they can create an image of a rational approach. 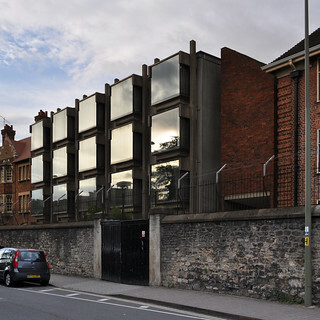 the expression of the individual bays and the elaborate articulation of the concrete beams and columns, these tell us of a strict inner logic that gives the wolfson building much of its power. you'll recognize the same elements in jacobsen's st. catherine's college, a project I see as closely related and on which arup did the engineering. the stairs of the wolfson are housed in two separate brick volumes, a move closer to how stirling would work, yet the collective effect of the parts is something very much its own. one of the best buildings in town. this photo was uploaded with a CC license and may be used free of charge and in any way you see fit. if possible, please name photographer "SEIER+SEIER". if not, don't.